The Dalek Mod - Updated (July 1st 2018) - Tardis, Sonic Screwdrivers, Daleks, Cybermen, Time travel and much more! Recommended fixes: Daleks need to shoot you. Cybermen as well. Daleks should have a mutant inside. Add current Cybermen. Then just add even a basic TARDIS and I will love you. You should team up with the weeping angel creator. It could be amazing! Anyways, while a_dizzle is a talented dev I belive he doesnt do much modding anymore. He makes sure weeping angels stays up to date but thats all. Plus I have slightly Updated the Model for Daleks I have changed the gin slightly and also the base! First Shot of the one Of The Movie Daleks In Game! Just compiling it then I will test it quickly then post the download! Do Daleks have ranged attacks now? Does it crash it upon placing it in the world or loading up the world? When I left click it in survival, it crashes. I'll have a look into this! 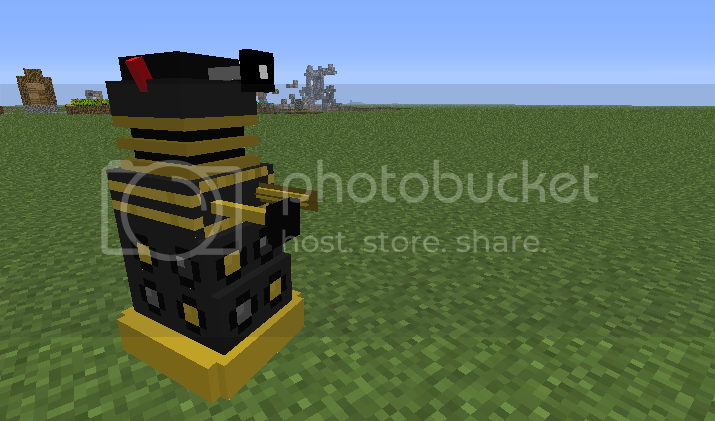 I made a Dalek mod with my cousin last year but we kinda abandoned the project so it's nice to see someone else bringing the Daleks back to Minecraft! I was thinking of implementing a Skaro dimension! I am going to try and implement the cybermen infecting villages and also the empty Child infecting them as well! Lol you should live in Western New York. THey dont call us Americas snow capitol for nothing lol. Its funny when we see people who dont usually get snow FREAK out and close their schools when they get less than an inch of snow. Meanwhile we get about 2 feet of snow and schools are still open lol. About 2 years ago we had just over a foot and about 20 of 1300 people turned up for school! Also I will hopefully be implementing Ranged attacks on daleks and Autons, and I am also gong to start work on A Skaro dimension! when is the update? :? Hopefully Tomorrow afternoon, it depends if I have school or not tomorrow!